The Library is open throughout the week, when you can pop in to browse our books and find out more about what’s on at the Library. 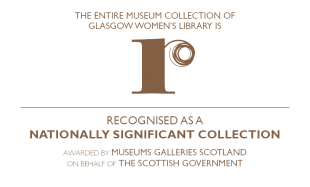 If you wish to access the archive or museum collections, or would like to visit the Library outside these hours, please contact us. We are sometimes open outwith our usual opening hours for specific events: see What’s On for details. See Where to find us for directions to the Library by bus, train, or car. If you need help accessing the library, or would like more information about access, please contact us and we will be very happy to offer you assistance. We have a small kitchen where tea and coffee is available for a small donation. The library is a unique, welcoming space with a learning programme, a lending library, an archive and museum store, and exhibition spaces. We are happy to welcome visiting groups from anywhere in Scotland by prior arrangement, when we can show you around and tell you about our history and our plans for the future. It is essential to book group visits in advance. To make arrangements for a group visit and tour, please contact us. If it is difficult for your group to travel to Glasgow, we can also visit you as part of our national lifelong learning programme.